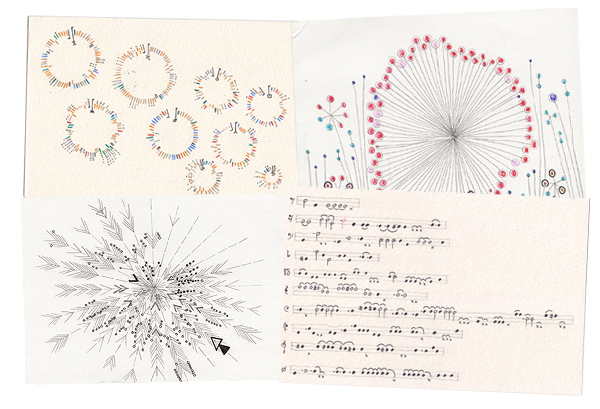 A few of you sent us the link to Dear Data this week — an intriguing project mixing information visualization with postcards and mail. We loved reading about it and thought we should share it with everyone! Giorgia and Stefanie have a few things in common: they’re the same age, only children, love drawing and are both information designers. 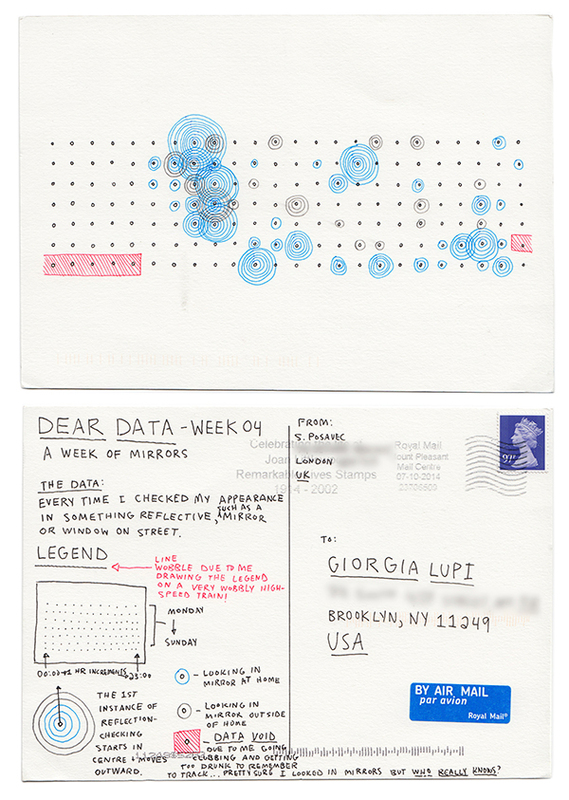 They live across the ocean from each other, but decided to embark on an adventure together: to send each other weekly postcards, depicting their weeks as data graphics! Each week has a loose theme, which they turn into an infographic. 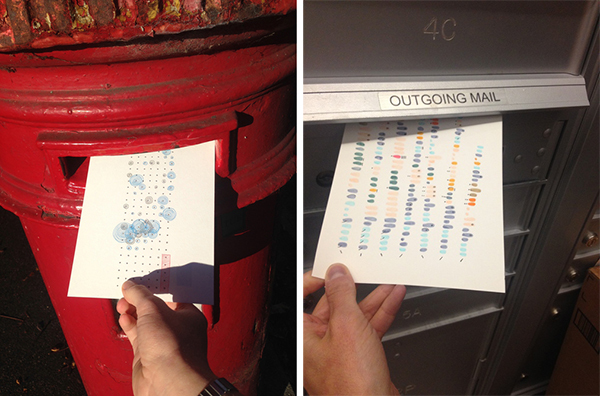 For example: counting the number of times they check themselves on a mirror, how much complaining they did or how often they picked up their phone… When the postcard is done, they mail it to each other! Each card is unique and mysterious, urging you to check the legend on the back before having a second, closer look at the front image. The result is really fascinating, an analytical yet intimate glimpse into Giorgia and Stefanie’s lives and the way they see and measure their world. Really interesting thing and looks magically! Thank you Giorgia and Stephania! a step ahead, superb, congrats! I would like to know a bit more about them, how they know each other and what got them started..ill check out the website! WOW! anybody interested in doing a similar one-time exchange on an accorded subject?! just send us a message! And another way of injecting postcards that are not "postcards" into the Postcrossing mailstream! Hand-drawing graphics like these must take an immense amount of time though, I wonder if there is software that could help? Great idea!! 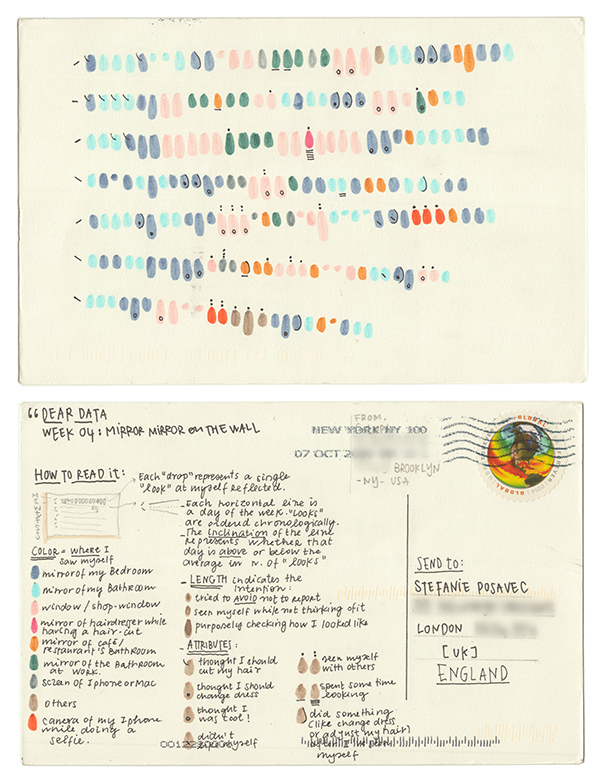 as a data analyser and snailmail lover, I love it!! Definitely a creative way to think outside the box. Amazing! I heard an interview with them on CBC radio, glad you also featured this here! estoy interesado en esta linda historia. -Food eaten: Color coding veggie, fruit, meat, dairy, candy etc. Ok..now I have to go check the website. Thanks for sharing! fantastic, very interesting, great! I love it! So creative! Extremely talented.. A great idea.. Keep it up!! Funny to see, although I don't have such an informatic mind at all! Such fun, so creative, thank you! Takes all kinds, I guess! Thanks for sharing this interesting story. What a cool idea. Maybe doing something like this would help me overcome my fear of mathematics.